While the Japanese dance form Butoh was created during the emotional aftermath of World War II and is in many ways a response to that specific climate, the style is based in nuance and has never been stuck in time. As such, many contemporary artists—including Eiko and Koma, Trajal Harrell and Mina Nishimura—continue to find inspiration in its practice. In anticipation of two premieres at Mount Tremper Arts, Nishimura talks about her experience adopting and transforming Butoh principals and texts. For the Japanese dance artist Mina Nishimura, words are something to be treasured, especially when penned by Tatsumi Hijikata. Considered the father of Butoh, the rebellious avant-garde form known as the dance of darkness with its twisting shapes, Hijikata created a poetic language known as Butoh-fu. 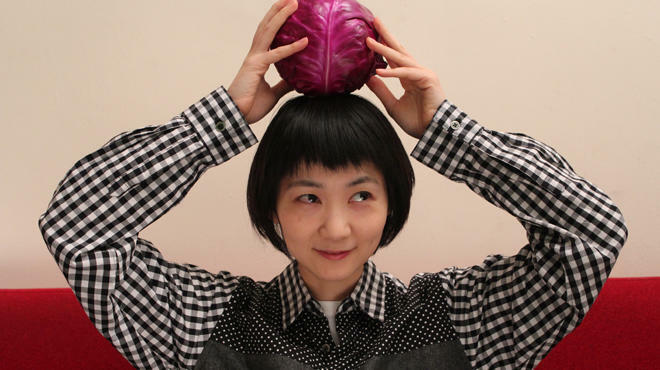 Nishimura mines it for her latest premieres, Princess Cabbage, a solo, and Quiet House, Ash Daughter, a group work. In each, she creates her own score by recomposing Hijikata’s texts to consider, as she puts it, “How can I compose internal landscapes, and what kind of external forms emerge out of it?” To see it in action, head for the hills: Nishimura’s imaginative program is the perfect excuse for a late-summer getaway. How did you become interested in Butoh? I met Kota [Yamazaki], my husband, and he was a very active Butoh performer, especially when he was in his twenties. He got into more contemporary choreography later, but when he was young, he was really involved in the Butoh community. That was the ’80s. Because of him, I had the chance to meet a lot of Butoh artists—his friends, older people—and I had a chance to read their books. Ko Murobushi, Masaki Iwana and even Akira Kasai, Kota’s teacher. I became really good friends with the Akira Kasai’s third son. He’s my generation but a little bit older. So I was surrounded by these people, and sometimes I took workshops. Also, I’ve been working with Kota, and although he’s more of a contemporary artist, his practice and philosophy are very much influenced by Butoh. For this project, I got especially interested in Butoh-fu. It can be translated as “Butoh score,” but score makes people think of a music score. It’s more like a documentation—either verbal or written languages of Tatsumi Hijikata about his practice and choreography. He left behind a bunch of strange words, so that became Butoh-fu. It’s like a poem almost—nonsense, grotesque. Usually these texts provoke imagery of a sickened, decayed or weakened, ugly body, and each word speaks to your body and guides it to a specific mode or state or even a certain type of movement. I was very interested in this language and these images. I imagine that originally he made a movement first, and then to remember that state, maybe he came up with these words. I’m not sure if that’s true. Originally, choreography comes first, but now we have only these words, and it’s up to us how we use them. I find this language to be a treasure from him. Yeah. “Throw up something blue and something red.” [Laughs] It’s so strange! Even my title of the group piece, Quiet House, Ash Daughter came from the Butoh score. They were from two different lines, and I put them together. That’s how I used the images for the creation of this piece. I selected the words, and I recomposed the images and created my own score. I didn’t read everything, but I read quite a lot and first wrote down the words that spoke to my body more than others. Then I composed a little poem out of those. And then you move from that score? Yes. I am showing two different works at Mount Tremper. Both pieces use almost the exact same Butoh score, but the approach is quite different. In the solo work, Princess Cabbage, physicalizing theses images perfectly was not my intention. It’s more about how I can relate to these images, so it got transformed into movement. I also drew body images. For example, one body has a train running on the skin. [She stretches the inside of her arm and strokes her fingers up it.] Or a body has a bird on its back. I kind of swallowed these words and digested them with my body to see what kind of visual image I would see. In the process, I did a lot of drawing. This is probably the final version of this solo. I’ve performed it three times, and in the past three versions, the act of drawing was part of the piece. Now I feel like I have accumulated images in my body, so for this version, I will focus more on the relationship between my body and these accumulated images—either visual images that I draw or the written language of Tatsumi Hijikata. Because these are language-based images, I feel like there is space to translate different ways or a looseness or ambiguity. It’s written words; it’s really up to you how you translate. And we don’t know what the words are? No, but I’m planning to use part of the words as a sound score. That was my relationship to the words for my solo work. For the group piece, in the beginning of the process, I was not using the Butoh score. I knew that the group piece started with the question: How can I compose internal landscapes, and what kind of external forms emerge out of it? That was my interest and question for the piece, and it was also related to my ongoing interest about nuanced forms. What’s the relationship between nuances and actual form? Maybe nuances can be replaced by something like emotion. In a way, that is the continuation of the research, and I thought to further this kind of research, we could borrow language from the Butoh score. The research was so elusive—it’s like exploring a range in the gray-color scale. The gray itself is already ambiguous, but exploring the range in the gray color is even more ambiguous. I thought it would be useful to have some concrete material. Around the same time, I was making the solo piece and thought, Maybe I can use the same material for the group piece. In Quiet House, the audience is surrounded by the dancers. Why? I thought this piece would be very foggy and hazy, like a moving-painting kind of piece, and that for the audience, rather than looking at the foggy forest from the outside, they would want to be in the foggy forest. I was inspired by one of Hijikata’s lines: “I let my sister dwell in my body. When she stands up in my body, I involuntarily sit down. When she falls down, I fall down. Yet there is something more to it, than this simple correlation.” I hope we can have this kind of relationship between the audience and the performers.